This apartment is only available on request, and on special terms. Maestro, the maestro is the name given to a north-westerly wind which blows in summer in the Adriatic when pressure is low over the Balkan peninsula. It is a fresh breeze accompanied by fine weather and light clouds. The top floor apartment "Maestro" a very high standard apartment, which is a fantastically light and airy apartment with nice views out over the rooftops of Budva. This premium class apartments can provide the most comfortable and cozy living conditions while you will stay in Budva. The apartment is new and recently re-decorated (2010) and is furnished and finished to a very high standard, with modern and light fixtures and soft furnishings. It contains two terrace. A very large sunny living area which open up to a beautiful balcony. Loggia and balcony for the evening sun. In the bedroom is a Jacuzzi. 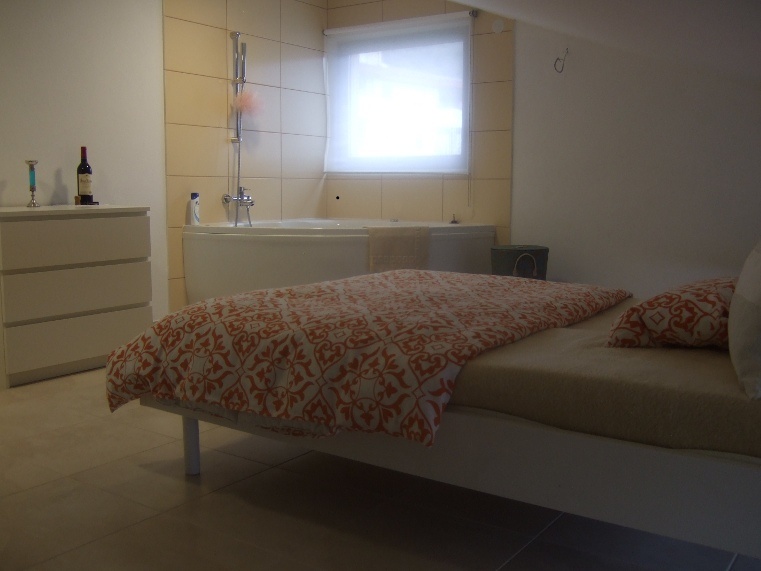 - 10 minutes walk to the beach "Slovenska Plaza". - 10 - 15 walk to the old town.